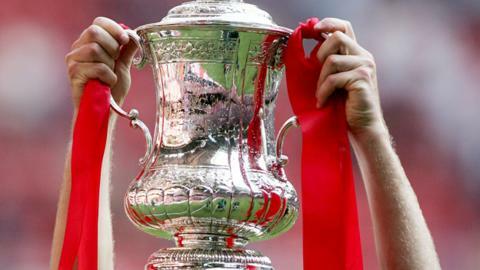 Wrexham booked their place in the first round proper of the FA Cup after easing past Southport in the fourth qualifying round at the Racecourse Ground. Captain Dean Keates put the home side ahead on the stroke of half-time with a 20-yard free-kick. Wrexham improved after the break but had to wait until the 90th minute for the second when Brett Ormerod scored his first for the club. The Dragons reached the third round last season before losing to Brighton. "At the end of the day you have to win a football match, by hook or by crook, whether it's three points or the next round of the cup. "We've managed to bounce back from last Saturday [a 4-2 home defeat to Lincoln] which is a good sign, I'm pleased with the win. "We didn't play fantastically well, at times we had some good moves, but it's all about getting in that draw. "I thought Brett [Ormerod], I'd put him down the middle and give him a go - he scored a couple in training yesterday - and he looked quality today and... I'm made up for him and I said to him at half-time he would score today."